White wall tiles - I'm looking for wall tile that is white and not boring - this looks perfect. Would you mind sharing the name of this one? Thank you. Beautiful work! Thank you so much for the reply. I appreciate the accurate information and Walker Zanger is tile heaven. I have another almost identical called Runway Series from Bedrosian's Tile. Love the glass wall tile, where can get it? who is the manufacturer of the mosaic tile? This exact tile is available at homedepot.com. What are these tiles? - Where do I find them? You can get them at Lowes. They are press and stick. Wall mount faucet - I was told that it's against the plumbing code to have a wall mount faucet for a bath tub that had separate hot and cold handles. Several faucet and plumbing supply rooms told me this in San Francisco. Yet here in this picture I see exactly that. I was told I had to use either a Floor mount faucet, or a Deck mount, but not a wall mount. If I wanted a wall mount they said it needed to be a single handle like a shower control. Please tell me what this wall mount is and how you got it to pass inspection - I want the same thing. Thanks! kisu, going through this right now. Was told same thing in Marin, it's against code. But just called CTW in novato and they said California faucets has them. There are plenty of wall mounted lav faucets two handle, but not tub fillers. I've been looking everywhere. See below, in the wrong spot! Can I Please Use This Photo Too? - I think this photo would be great for a different blog post. Can I please use it, too? FYI, tub spouts alone, deck or wall-mounted, can have old-style hot & cold. When an installation has overhead fixed, rain or handshowers, there must be anti-scald valving. This can be either pressure balance or thermostatic technology. Can you identify the brand and size of background tiles? also the grout, if possible? 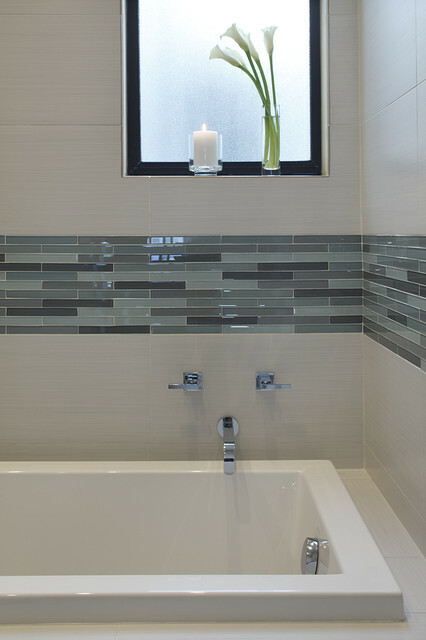 The tiles on this picture can be bought from , www.specstones.com (showroom in SF California. their names are. Axis Bianco 12"x24" and Lucian Glass glossy 2"x12". Faucet Q - I love the modern faucet. I am renovating a bathroom in Vermont and no idea regarding the code as to if I can have a separate hot and cold however I like the streamlined look which goes great with the glass tiles too. Can you please let me know the manufacturer of the faucet? how did you manage the window edging? is there a schulter strip used w tile inside the window? Is there a bullnose tile to go with wall tiles? I don't think there was a factory bullnose, but it was a white porcelain, so my installer was able to fabricate his own on site. Thickness of accent tiles - What is the thickness of the accent tile layer around the tub? We used a 12" high stripe, comprised of the 1" x 8" custom blend Ann Sacks glass tiles. What is the size of the tub? I believe we used a 7 foot tub here. What is the name of this tub? Is it a shower and tub combo? Neptune Bath makes a similar tub called "ZEN". This drop-in tub has an available option of a top lip with varying heights of 1", 2", 3" or 4". Would love to know the name of the tile used here? can you tell me about this window, is it privacy glass? Yes, it's a standard opaque exterior window. The contractor provided this one, so I don't have a manufacturer for you- sorry! Who is the manufacturer of the faucets? Thanks you. What type of tile and where is it from? - What type of tile and where is it from? Love the tile and design beautiful job!! What colour is the wall tile and glass accent ? Wall mount faucet - Can you please tell me who makes this faucet? It is just what I'm looking for, though I need a brushed finish. Wall mounts like this are fine where I live but getting harder to find. Hoping to also work in a hand held shower .... Thank you!!! what was the expenses? - how much did this cost to make? What is the name of the wall tiles? Thank you! Style Secret: Serious ShineContemporary rooms are nothing if not polished, and that means high-gloss surfaces fit right in. Chrome, steel, lacquer, glass, plastic, tile and more all work in tandem to help bounce light around a space. Mix materials for contrast and depth.But also consider… Too much reflectivity will make your eyeballs quiver. Break up the gleam with matte elements — check out the beautiful interplay of glossy and honed surfaces in this bath. Or temper shine with texture, such as ribbed glass or brushed nickel.